Sorry, World's Largest Hammock is permanently closed. Though any hammock usually suffices so long as it is located beachside, the more hammock the better has been the operating philosophy of Nag’s Head Hammocks since 1974. 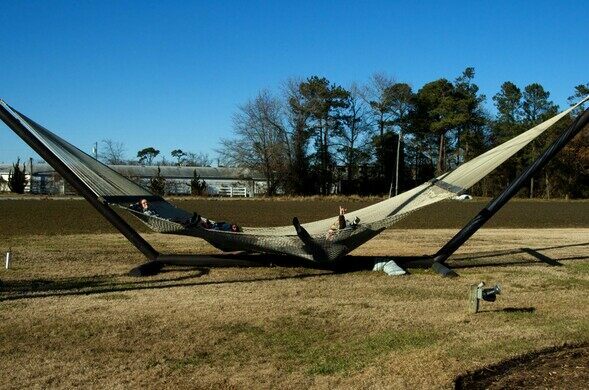 Located in mainland North Carolina just before passing over the Albemarle Sound on the Wright Memorial Bridge, the world’s largest hammock stands as both a testament to the ultimate beach vacation, and as a relic of roadside Americana that is rapidly disappearing. Large and in-charge, the hammock was woven from over 10,000 feet of rope and spans 42 feet. In front of the store, passers-by can stop for a group nap in the hammock strung across a metal frame that is not to be trifled with. No really: jumping into the hammock haphazardly can cause large bruises when one miscalculates and lands on the central span running beneath the webbing! While the pros and cons of sharing the average hammock shall be left to each individual’s discretion, this one can hold up to 8000 lbs, so bringing friends is a must! Approximately two miles north of the Wright Memorial Bridge on NC route 158 on the East side of the road. The Cadillac Ranch for monster truck aficionados. This massive chalk hill carving is one of England's most beloved giant horse geoglyphs. A tribute to an iconic act of defiance from the Croatian War of Independence involving a small car.